Free trade means that countries can import and export goods without any tariff barriers or other non-tariff barriers to trade. Essentially, free trade enables lower prices for consumers, increased exports, benefits from economies of scale and a greater choice of goods. This explains that by specialising in goods where countries have a lower opportunity cost, there can be an increase in economic welfare for all countries. Free trade enables countries to specialise in those goods where they have a comparative advantage. 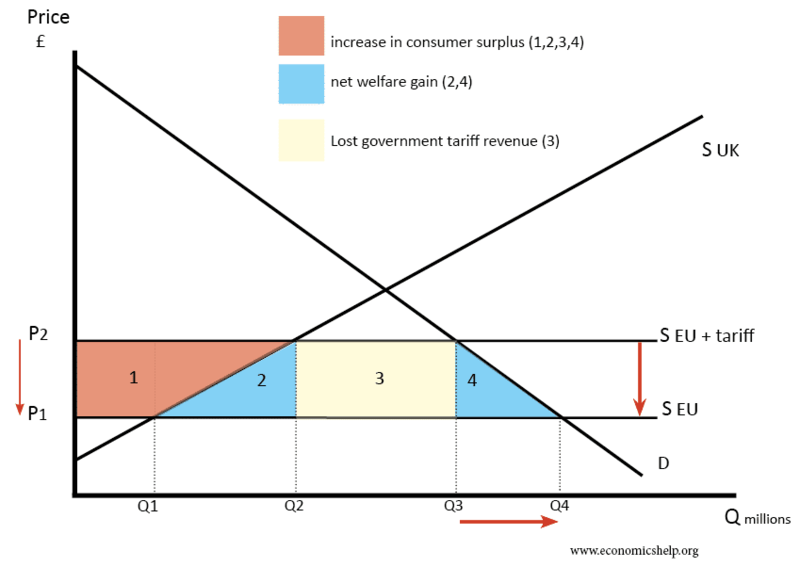 Essentially, removing tariffs leads to lower prices for consumers – so the price of imported food, clothes and computers will be lower. When the UK joined the EEC – the price of many imports from Europe fell. As well as benefits for consumers importing goods, firms exporting goods where the UK has a comparative advantage will also see a significant improvement in economic welfare. Lower tariffs on UK exports will enable a higher quantity of exports boosting UK jobs and economic growth. If countries can specialise in certain goods they can benefit from economies of scale and lower average costs; this is especially true in industries with high fixed costs or that require high levels of investment. The benefits of economies of scale will ultimately lead to lower prices for consumers and greater efficiency for exporting firms. With more trade, domestic firms will face more competition from abroad. Therefore, there will be more incentives to cut costs and increase efficiency. It may prevent domestic monopolies from charging too high prices. 6. Trade is an engine of growth. World trade has increased by an average of 7% since 1945, causing this to be one of the significant contributors to economic growth. Middle Eastern countries such as Qatar are very rich in reserves of oil, but without trade, there would be not much benefit in having so much oil. Japan, on the other hand, has very few raw materials; without trade, it would have low GDP. Adam Smith, The Wealth Of Nations (1776) Smith generally supported free trade arguing countries should specialise in their areas of expertise. He made the argument there is no point in protecting the Scottish wine industry if it would cost 30 times the price of importing wine from warmer countries. Smith also argued that if our competitors become better off, they will be able to buy more of our exports. Smith saw trade as a way for all countries to become better off. This was in contrast to the zero-sum Mercantilist theories popular at the time. Last updated 1 July 2017.